Mikaela Shiffrin (Atomic Redster photo courtesy of Facebook). 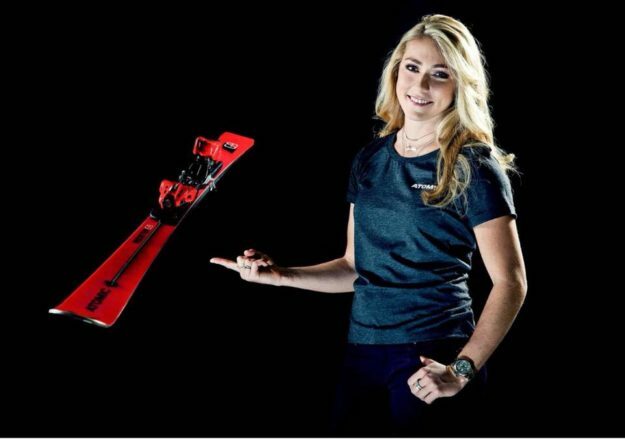 In her first race as the ambassador of the new Ikon Pass, EagleVail’s Mikaela Shiffrin finished 7th in a World Cup giant slalom in Lenzerheide, Switzerland on Saturday. Tessa Worley of France won the final GS before next month’s Pyeongchang Winter Olympics — nearly two seconds ahead of Shiffrin. After starting 2018 with five straight World Cup wins, Shiffrin is now winless in her last five starts. She still leads the overall chase by nearly 800 points, and she’ll have a shot at win number 11 this season in a slalom on Sunday. On Friday, Shiffrin announced she’s working with Vail Resorts’ rival Alterra Mountain Company to promote the new 23-mountain ski pass that will launch next season to challenge the 14-mountain Vail Resorts Epic Pass. “I’m proud to be part of the Ikon Pass family and their 23 destinations. I can’t wait to ski them all,” Shiffrin posted on Facebook Friday. The Ikon Pass, which has not yet announced pricing or access levels, will include Winter Park, Copper Mountain, Eldora, Steamboat and Aspen Snowmass in Colorado. Shiffrin’s family owns a home in EagleVail, at the base of Beaver Creek, where the 41-time World Cup winner (sixth most on the all-time women’s list), won a gold medal in slalom at the 2015 World Alpine Ski Championships. On recent promotional ads for the next month’s Pyeongchang Winter Olympics on NBC, the defending slalom gold medalist from Sochi says she’s from Vail. Several of the top executives for Alterra Mountain Company are former Vail executives who still own homes in the Vail Valley. According to the Associated Press, Shiffrin, who stood fifth after the first run of GS on Saturday, uncharacteristically skied the steep section of the course cautiously in both runs. Vail’s Sarah Schleper, who’s skiing for Mexico because of her dual citizenship and trying to make her fifth Olympic team, failed to qualify for a second run on Saturday. Vail’s Lindsey Vonn, the all-time women’s winner with 79 career World Cup victories, did not race in Saturday’s GS, taking the day off after just missing the podium on Friday with a fourth-place finish in an alpine combined at Lenzerheide. Vonn, who owns a home in East Vail, began a sponsorship deal with Vail Resorts back in 2009.